The walking steps up several gears straight away today as you leave the English Riviera for sweeping red sandstone panoramas looking ahead towards Lyme Bay, a marked difference in scenery for those who have made it here after weeks of walking the hard granite rocks around Cornwall. The rollercoaster trail rises and descends from the off with the walker enjoying lush wooded paths traversing the Valley of the Rocks with steep twisting steps and a precarious rocky ledge to negotiate, the aptly named Goat Path, before reaching Maidencombe a pleasant thatched cottage village and beach with the usual options for cream teas or a swimming break. A steep zigzagging trail in and out of the woods above the cliffs follows, until the path eventually breaks into open fields with inspiring views over Teignmouth, and after climbing along the sandstone cliffs you arrive at The Ness, the iconic and atmospheric wood topped Rocky Stack guarding the entrance to Teighmouth and Shaldon. An 80m tunnel cut through the rock here reveals a great swimming beach for those wanting to cool off before you catch the Ferry from Shaldon to Teignmouth across the pretty River Teign estuary. This crossing has been in place since the 13th Century though don’t be put off by the ferry boat claiming to be the oldest in the country – we are pretty sure it’s not the original one! The next section brings you to a short run of classic south Devon resorts and there is something quite engaging about flirting with these places briefly whilst passing through on the coast path, taking in the grand history of this part of the coastline and its visitors before leaving the bustle behind to head back out onto the Devon Coastal Path. Teignmouth offers a good lunch stop with plenty of facilities and two pleasant beachy areas along the promenade and Victorian Pier. It has an unfortunate history - razed by the Danes, rebuilt, then burnt down in 14th Century, attacked by the French in the 17th C and even hit by the Germans in World War 2....The walk takes you through the heart of this fashionable 19thC Resort passing the Lifeboat Station, Museum and pier as you make your way along the sea wall. From this point on you start to cross swords with the impressive coastal railway – the mainline from London and a hugely impressive masterpiece of engineering created by none other than Isambard Brunel. It was here he experimented with running his audacious Atmospheric railway run by nothing more than pressurised air and an internal vacuum. 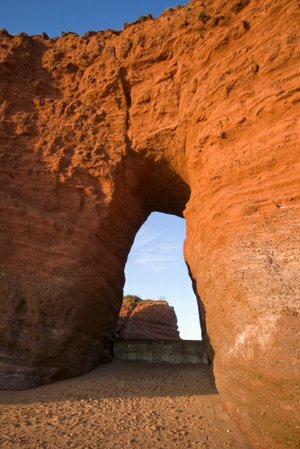 Whilst the project failed the line remains, one of the UK’s classic train journeys clinging to the edge of the coast and sweeping past crashing waves through a run of 5 tunnels which pierce the red cliffs and skirt the impressive red sandstone stacks that now appear as constant companions to the walker along the coastline here. Dawlish brings its notoriety as the home of the bizarre black swans which you will spot gliding around Dawlish Water in the centre of the town. A much loved location for writers including Jane Austen and Dickens (this was his birthplace of Nicholas Nickleby), the small fishing village grew around the railway and if the tides work for you after pausing here you will be able to walk the remainder of the route to the River Exe along the dramatic sea wall vying with the precarious railine to Exmouth. 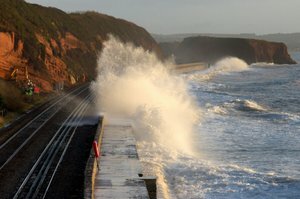 At Dawlish Warren in complete contrast to the resorts, the route enters Dawlish Warren Nature Reserve and designated Site of Special Scientific Interest with superb vistas now over a semi wilderness of grass, reed lands, sand and mud flats at the mouth of the mighty river Exe. 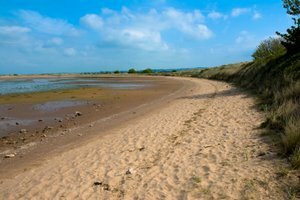 Those with time before the ferry to Exmouth can take a circular walk to the end of the sandy spit here and enjoy its blue flag graded beaches. Wander through rare fauna and flora amongst the unprecedented levels of migrating birdlife which abound here on the mudflats and dunes all of which can be stalked from the public bird hide and visitors centre on route – this is one of the UK’s premier water based bird watching reserves with in excess of 20,000 feathered visitors coming through during migrations. You finish the walk today by catching the Starcross Passenger Ferry from the old Wooden Pier which leaves by one of Brunel’s old Atmospheric Train Pumping Stations and the weary walker enjoys an end of day cruise across this beautiful expanse of estuary to arrive at Exmouth and golden sands backed with rows of splendid Georgian Houses shrouded in Napoleonic Heritage. Once again enjoy great restaurants and ambience at your overnight stay here at a fashionable location that is the entrance to the Jurassic Coast.